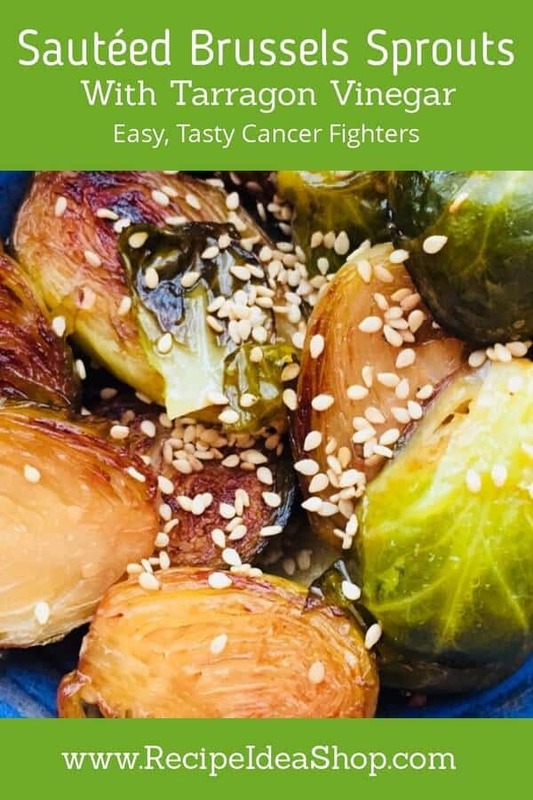 Sautéed Brussels Sprouts Recipe with Tarragon Infused Vinegar or Balsamic Reduction is a beautiful, delicious side dish with great cancer-fighting properties. And it takes just 35 minutes. 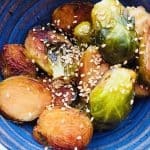 This Sautéed Brussels Sprouts recipe is not your mom’s Brussels sprouts! We had this Sauteed Brussels Sprouts Recipe with leftover Dry Rub Ribs (Don made them over the weekend; ribs take a long time, but are SO worth it) and a Baked Potato. 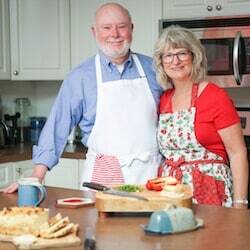 You know how to make a baked potato, right? Calphalon Pan with Vegetable Steamer Insert. Buy yours today on Amazon. I love my vegetable steamer. This one is similar to what I have and what’s great about this type of steamer is your can use it as a steamer or a simple cooking pot with a cover. Sautéed Brussels Sprouts Recipewith Balsamic Reduction or Tarragon Infused Vinegar is a beautiful, delicious side dish with great cancer-fighting properties. And it takes just 35 minutes. In a vegetable steamer, cook the Brussels sprouts until a fork will easily pierce them about 1/3 the way through. Don’t overcook. Remove them promptly and slice them in half through the stem. Quickly place all the Brussels sprouts, cut side down, in the skillet and let them cook until they begin to brown. Add the vinegar, reduce the heat to low, letting the Brussels sprouts sit in the skillet until the vinegar has either been boiled away or is thick and syrupy. 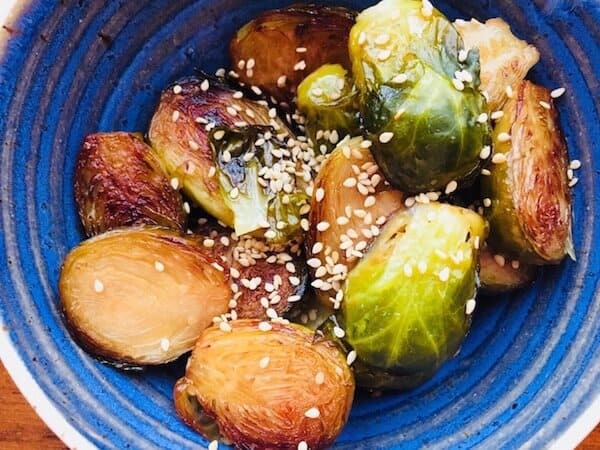 Toss the Brussel sprouts with the sesame seeds. Add the salt and pepper and serve hot. 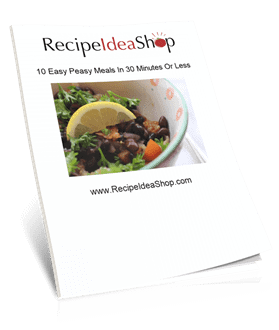 If you want more delicious recipes like this, please sign up for our free cookbook. Sautéed Brussels Sprouts Recipe Nutrition Label. Each serving is about 1/4 pound of sprouts. Don here. I love Brussels sprouts. Always have since I was a little kid. Back “in the day” Mom bought frozen ones and they were okay when she boiled them and served them with a splash of vinegar. Then one summer we grew them in our garden. I got a few, the rabbits got the most. But those few fresh ones spoiled me forever. Now if I can’t get them fresh, I won’t bother. Brussels sprouts are very dense “little cabbages” and take a while to cook so they are tender throughout. Unlike my mom, I don’t boil them. I cook them in the top of a steamer and for 2 to 4 cups, it takes about 30 minutes. In this recipe I shorten that time since I will brown them in a skillet after they have been partially cooked.